Our security surveillance system is on duty 24/7. In combination with our computerized gate access, a complete history of customers entering and leaving the facility is recorded every day. Brightly lit driveways add additional security and convenience for you and your belongings. 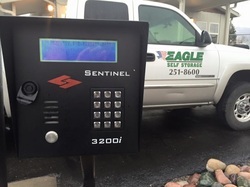 Keeping your belongings safe is very important to us, and at Eagle Self Storage, your peace of mind is our top priority. Security-code gate access controls keep unauthorized visitors from entering the premises, providing a powerful first line of defense against loss or damage of your valuables. Access time and dates of entry are recorded round the clock..
A keypad at the front gate means you can get to your valuables at any time, while no unauthorized visitors can gain access. We assign our customers their own PIN code for entery and exit of our facility. Our gate access hours are seven days a week M-F 5:00AM to 10:PM including holidays.